Drillinginfo reports that the US saw a 250% increase in mergers and acquisitions activity in the third quarter. 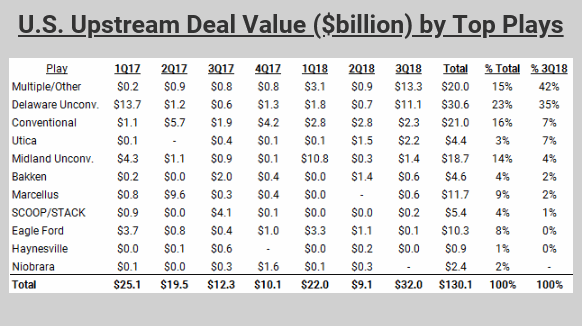 U.S. oil and gas M&A activity soared in the 3Q to $32 billion, a 250 percent increase from $9.1 billion in 2Q, according to new data from Drillinginfo, which provides software and data analytic services to the energy industry. Third quarter numbers reflect big upstream deals including BP plc’s $10.5 billion purchase of BHP Billiton subsidiary Petrohawk Energy Corporation to acquire onshore assets in the Permian, Eagle Ford, Fayetteville and Haynesville plays, Permian-focused Diamondback Energy’s $9.2 billion all-stock deal purchase of Energen Corporation and Chesapeake Energy Corp.’s sell of its Utica shale assets to Encino Acquisition Partners for $1.9 billion. Drillinginfo said 3Q’s M&A activity broke all quarterly records dating back to as far back as 4Q 2012. It’s also 76 percent above the quarterly average of $18.3 billion dating back to 2009. Drillinginfo senior director Brian Lidsky said he expects U.S. M&A activity to continue at a heightened level. Lidsky goes on to call Diamondback’s purchase the beginning of a trend – rather than a one-off.